﻿ Centering (Balancing) Your Emotions. We all have times when we feel off center or emotionally out of balance. You are emotionally out of balance when you feel any of the negative emotions such as fear, anger, stress, or if you just feel drained of energy (not physical but emotional energy). There are a number of things that can drain your emotional energy, things such as pushing yourself, or concentrating hard for a long period of time. You can also drain your energy when you are sick and there are strong demands on your immune system. If you are unusually sensitive, something as simple as low air pressure or a lack of sunshine or a troubled close friend can drain your emotional energy and depress your mood. When any of these things happen, you can restore your emotional balance by using a Balancing or Centering exercise to help you feel calm and tranquil again. After doing what for most people amounts to a one or two minute exercise, you will feel as calm as is possible for who you are. Simply put, centering yourself makes you the best that you can be emotionally. 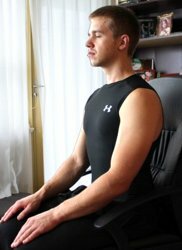 There are a number of different exercises that can be used for centering. The exercise given here is known to work well, and is considered a very good one. It is actually more than a balancing exercise. It is a powerful way of drawing on the Universal Energy (white light) to restore depleted energy. When the Universal Energy flows through you, you automatically take from it what you need, so it is not necessary to think about drawing in any specific type of energy. Sit in a chair with your back upright and both feet on the floor. Sitting in the lotus position also works well. Close your eyes. Visualize yourself standing and holding a sword out in front of you with both hands. Visualize a bright glow at the tip of the sword. Move the glowing tip of the sword all the way around you, describing a complete circle around your body. When the sword returns to its original position, it leaves a horizontal ring of bright glow around your body. Now visualize a vertical shaft of white light coming down from above and enveloping you. The size of the shaft is so that the outer edge of the shaft comes down through the glow of the circle that you just described with the sword. Concentrate on the white light. Hold it there and continue to visualize it. Breathe slowly, steadily and deeply. Hold the image of the shaft of white light that encompasses you, for about a minute, or approximately 8 breaths, or until you begin to feel calmer and more tranquil. If your mind wanders and the white light disappears during the exercise, simply visualize the white light again, gently but firmly. If your energy is very depleted, or you are fearful or angry or extremely tense, you may need to visualize the light for upwards of 3 to 5 minutes in order to restore your calmness.